Yet they choose to ignore it. Have they become too statist and shortsighted? Why is it that the left is so enamored with gun control? Why do they obsess about it in spite of the fact that if anything they have a stronger case for an armed populace than does the right? Their most common anti-gun argument draws upon history, but a selective reading of it. In 1776, liberals contend, the British military was armed with wooden ships, horse-drawn cannons, and single-shot muskets. The colonists had access to similar weapons, just fewer of them. The article, written by H. A. Goodman, contains some truly puzzling arguments about how the failure of the Whisky Rebellion proves the impossibility of a successful uprising: “armed Americans have never been able to overthrow their government, even in the early years of the country.” Since he never mentions it, I can only assume Mr. Goodman hasn’t heard of the successful American Revolution, which just a few years earlier had succeeded in throwing off British rule and establishing the very nation against which the Whisky rebels revolted. Goodman’s proof-texting of American history is ignorant at best. But setting aside his queer implication that the bare-bones federal government of the 1790s was invincible, he ignores a variety of historical examples of successful popular uprisings in nations far less heavily armed than present-day America. Or, if you need an example that’s a little closer to home, look at Vietnam. Despite the American military’s vast superiority of arms, the ragtag militias and guerrilla tactics of the VC and NVA managed to harass and bloody U.S. forces until America’s political will finally failed. Surely armed guerillas could engage American forces in the streets of Baltimore just as effectively as Iraqi insurgents in Baghdad. These historical examples are drawn from across the globe and span over two centuries. But with the exception of the last example, they have one thing in common: leftist politics. From the anti-monarchist French revolutionaries to the Marxist-Leninist forces of Ho Chi Minh, all fought to overthrow the conservative status quo in order to implement a radical program of social change. Most American leftists today would sympathize with some of those struggles, even if they didn’t outright support them. Why, then, is there not a liberal wing of the NRA, threatening armed revolt if Trump oversteps his power? The closest thing I’ve been able to find is the LGBT-plus-gun-rights advocacy group Pink Pistols. Although the single-issue organization focuses its rhetoric more on individual self-defense against hate crimes than collective defense against government persecution, they do use as their logo a badge that homosexuals were forced to wear during the Holocaust, suggesting that resistance to homophobic state violence is at least a secondary concern. Following the election of President Donald Trump, Pink Pistols’ membership spiked. Throughout the history of the United States, from the disarmament of blacks under Jim Crow to California’s 1967 prohibition of open carry after armed Black Panthers began conducting “copwatching” patrols in their neighborhoods, gun control has been used to impose state authority on the same vulnerable communities liberals say they want to protect and empower. Vice News recently published a “Leftist Argument Against Gun Control,” presenting the case that for “a black leftist male” in a nation “founded on, by, and sustained through genocide, slavery, and theft,” giving the government “a total monopoly on violence” by “surrendering effective means of self-defense” is “suicide.” Or, to put it more simply, if cops are racist thugs who can’t be trusted, why should they be the only ones with guns? [T]he arms were distributed, and in the big towns of eastern Spain the Fascists were defeated by a huge effort, mainly of the working class… It was the kind of effort that could probably only be made by people who were fighting with a revolutionary intention. So, I say to the American left, if Trump announced tomorrow that he planned to outlaw the Democratic Party and arrest its leadership, how would you respond? Do you, like your predecessors around the world, still believe that some causes might be worth taking up arms against a tyrannical government? You spent the last administration telling the Cliven Bundys of the world to lay down their arms and trust the government. Now that the tables have turned and the enemy of all you hold dear sits in the Oval Office, history suggests you shouldn’t feel so confident taking your own advice. Grayson Quay is a freelance writer and M.A. student at Georgetown University. Is ‘Universal Authorship’ Such a Good Thing? Actually, as I thought I’d read a few times already and multiple links from a cursory web search confirmed, there has been a sustained spike in gun sales to those on the left since the election, although this has been more than counterbalanced by the sustained slump in sales to those on the right (who buy more when they do buy). But there are no recent incidents of armed groups rebelling successfully in the US. Although the government has often shown initial forbearance and patience, in the end the uprisings are quashed with whatever force is necessary. See Waco, or the Malheur National Wildlife Refuge, to name just two easily remembered examples. Because the uprisings have been relatively small and modesetly armed, posing no real threat to the power of the government, the level of force has been similarly restrained, usually with only a small number of deaths resulting. But I do not believe that the government would hesitate to use chemical, biological, or even nuclear weapons against the American people if the power or wealth of the ruling elites were truly in jeopardy. Guns, even fully automatic weapons, would be useless as a defense against such an onslaught. Just by way of context, I am a leftist. I regard those few of my fellow-leftists who speak of an armed insurrection as delusional. I can’t speak for the left, but I’m of it and here’s my take. The view of many on the left, including hunters and firearm hobbyists like me, is that a repeal of the second amendment, and an Australia-style removal of guns from circulation, is a reasonable sacrifice to make for the safety of kids in cinemas and revelers at concerts. Yes, even when weighed against the possibility of tyranny. It’s not a view I’m prepared to defend in detail, and I’m sure many here disagree, but there it is. Libertarians would call it paternalism. As we’ve seen, this view is irreconcilable with the conservative one, and thanks to the constitution, the NRA and our Supreme Court, the conservatives have the political upper hand. And worse for us on the left, guns are now a very successful partisan wedge. C’est la vie. Destruction in Vietnam, tax base in USA. Destruction in Afghanistan, tax base in USA. Civil war, destruction in CSA, tax base in USA. Destruction in USA, tax base in USA….oops! a. Not without French troops, Navy and French money. Both of these instance successful because the militaries in both countries, collapsed and sided with the revolutionaries Both had a civil war in which their militaries broke ranks from the established order. That collapse ended WWI for the Russians. Not without sizable aide material, logistical and advisory aide of the Chinese and Soviet Communists. In the years spanning WWII, Algerians were loyal well trained and experienced fighters. Additionally, the efforts by the French to quell Algerian rebels was largely successful. But as with all of the colonies held by Europe, the support required to retain them financially was just too great. WWII sapped all of Europe. Note: The evolutionary war in the colonies was clearly a leftest endeavor. Great Britain never took the revolution as seriously a they should have. Why should liberals bother with guns. They have turned most of the Republican to their way of thinking. Whine about Vietnam, distort the matter but seek redemption by advocating for needless, carelessly employed destructive military interventions elsewhere in the name of democracy. -killing children in the womb. freedom of thought and expression or the choice to refrain – required statement of loyalty to a political position for employment. I think its very clear that liberals are neither so oppressed that warrants weapon consideration or unsuccessful advancing their agenda. If the opposing party doesn’t oppose you there’s no need for a weapon. And to introduce Pres Trump as a threat to liberal agendas is a laugh. The hope was that he would slow the tidal wave. But it interesting to note that the only real successful gun prohibition occurs when citizens of the black persuasion get their hands on weapons. It seems the whites of both parties are more afraid of blacks than illegal immigrants. Armed Americans did not overthrow their government during the American Revolution. The colonial governments reformed themselves into states and formed a Continental Congress, which then waged war on the states’ behalf. The first battle of the war, at Lexington and Concord, was fought because the Massachusetts Committee of Public Safety was building up the provincial arsenal at Concord, under public auspices and control. The only popular uprisings during the American Revolution were ones like the Regulators in North Carolina, the tenants in upstate New York, and Shays Rebellion. All were crushed, because they were disorganized and lacked state resources. I would respond with nonviolent protest. (Although maybe not all that much: getting rid of the Democratic Party might be the best thing that could happen for progressivism). “Fighting back” with small arms would just give Trump the means to line up the support of the military behind him. If the full might of the US military is on Trump’s side, I think I bet on them over me and a few of my SF hipster friends armed with vintage Remingtons. (Using vintage arms would be so much cooler than using the modern, mass-produced ones). Modern revolutions are rarely won with small arms*. It’s all about who ends up with the sympathies of the military. See, for example, Egypt. A nonviolent resistance would be far more likely to be effective here. *Yeah, I know, Afghanistan, Iraq, etc. : modern militaries do sometimes have trouble defeating small-arms fueled insurgencies. But such insurgencies, even if they win, end up as dictatorships anyway, and usually destroy the country in the process. The great paradox of the gun control position is that as the per capita firearm homicide rate plummeted from 1993-2013, despite the presence of more guns and no strict gun control laws nationwide during that time period. When there was no empirical evidence to support the proposition that the federal government should restrict gun ownership generally, the position then morphed into addressing suicide, which might work though I see no reason for federal involvement, or stopping mass shooters, a very dubious argument considering that most proposals would have failed to prevent them without casting me and every other American into the government category of potential nut or domestic terrorist. Mr. Quay, you might be interested in an organization called Redneck Revolt, which has John Brown Gun Clubs in 20 states around the country. They are well know (on the left, at least) for open-carrying at protests, especially at protests against far-right or fascist groups. They had a fairly significant presence at Charlottesville. The American left has no problem with guns. They want guns. I think the author is confusing the left with liberal democrats. Who would be considered far right in most countries. But I don’t think the liberal democrats want to ban guns. They just want to make modest changes to existing gun laws to keep them out of the hands of psychopaths. You are falling into the trap of accepting Left-wing rhetoric at face value. “Gun control” is a cultural issue dressed up as a public safety issue by its proponents. The Left-leaners who advocate gun control do so because they see it as a way of punishing the gun owners who have voted the “wrong” way, and the cultural conservatives who have had the gall to resist the proposals of the wacky cultural Left. “Public safety” and “saving lives” is just a cover for the political and cultural initiatives of the Left. The left is obsessed with gun control because innocent people die from it. That’s like asking why conservatives are obsessed with abortion. And while HuffPo is in many ways the equivalent of a left-leaning Breitbart, they’re right. An armed revolution in America has little chance of success, outside of the military itself defecting. We “lost” Vietnam because it was an unpopular war where, atrocities aside, we tried to avoid civilian casualties and only target guerrillas hiding in the jungle and among the populace. We were unwilling to pay the costs of winning, not unable. As for why the left does not support gun control, it’s because the “advantage” of being armed in a revolution will probably never come up. Trump can barely keep the loyalty of his inner circle. If he outlaws the Democratic party the biggest response will be laughter. The potential benefit of potentially warding off a criminal are more likely, but still not that common. The costs of gun ownership come in the form of money and training. Then of course is the risk of an accidental shooting, or the risk that a criminal will be more likely to use deadly force if he believes you have a gun. On the same note, even legal gun ownership puts cops on edge, and the bar for proving that a police officer used excessive force when shooting a suspect is high. The hypothetical black guy who thinks the cops are racist thugs is still smart enough to know that the cop could shoot him for legally owning it and get away with it. We surely won’t need shoes then. The author’s article answers the question his headline poses. If that’s the case, no wonder few “on the left” or elsewhere agree. His is another attempt to perpetuate the myth that the 2nd amendment had anything to do with keeping the federal government in check, and if nothing else, the fate of the Whiskey rebellion is certainly an example in the matter. It is not really easy to believe that if pervasive private ownership would ever become an effective constraint on policing, let alone the oligarchy and the establishment powers, that “gun control” would be prevented by more or less ahistoric interpretations of the Constitution. You might want to adopt the glibertarian view that the very concept of government is akin to organized crime, but it would appears that gun ownership alone does not aid the latter anymore than the former. MLK had the balls to imagine resistance and overthrow to government without clutching to firearms every step along the way. His being silenced by a gun does not mean he would have been more likely to survive if he had carried, much less he would have been more successful. Whatever the response, it is the numbers, not the tools, that make a resistance. I have to admit that I do find attractive the author’s proposition that it would have to be “the left” – not the US military sworn to the Constitution, not Congress, not the population at large, and not even – the humanity – the Bundy’s that will save the rule of law. GUN CONTROL DOESNT MEAN NO GUNS. WHAT IS SO HARD TO UNDERSTAND ABOUT THIS?? We want sensible and safe gun ownership. We dont want to take your guns. We dont want to punish you for voting for someone we disagree with. We want people to own guns in a safe way. And just because YOU own yours in a safe way doesnt mean the majority of Americans do and even if they all do, why not codify safe ownership? How does that harm you at all? We dont want criminals to be allowed to purchase guns. We dont want kids to be able to stumble upon their parents guns. I own guns. I enjoy them very much. We want people to think about how we can cut down on the over 33,000 gun deaths per year and find it insane that that is somehow a partisan thought. Lets think about this. Why are we not allowed to study gun violence at a federal level? We study heart disease and car accidents and opioid deaths, why cant we look at another issue that is causing so many deaths? Specious examples. For heaven’sske the American Revolution would not have succeeded except for the French coming to join us and trapped Cornwalis’s Army. And the author surely knows what happened to the Southern States the seceded and the Confederacy was armed with much more than a few Rifles and pistols. Pretty lame arguments, but the author seems inordinately proud of them, which leads me to suspect the intellectual level of the guns for everyone crowd that the NRA has indoctrinated. I am not against people owning guns, I just think that since guns do not kill anyone, people do, that we should control the selling of guns to just anyone. It would mean less money for the gun manufacturers, so their organization is understandably against laws controlling the ownership of guns. I mean traffic lights don’t prevent all automobile accidents so we should not erect traffic lights? One of the “rules” for successful politics is to help (pay off) your coalition and harm the opposition. Since most of the people who join the NRA etc are “pro-law and order” and many “pro-military” (and probably GOP supporters) the automatic response for the left is to try to harm them- make guns and ammo more expensive, make owners buy “California legal rifles”, bankrupt manufacturers, close ranges, make collecting more difficult etc. It doesn’t matter if the stated policy aim- i.e. cut down crime- are achieved. That’s irrelevant. The real aim is simply to hurt the opposition. Because the overwhelming evidence from the rest of the developed world proves that A) it works in reducing gun violence, and B) people can still have guns. They just have access to less of them, and have to go to greater lengths to prove they’re a responsible gun owner. Why this is controversial to any human living today boggles the mind. 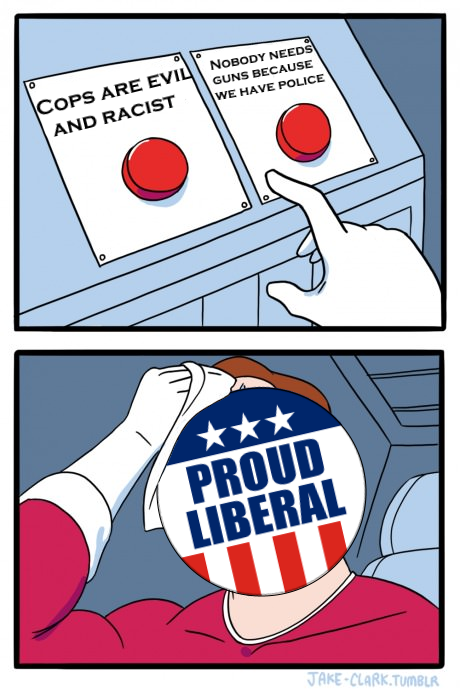 Because liberals don’t want to kill people for their political beliefs. We’d rather not threaten violence as a first resort, or meet violence with violence in an escalating cycle. That is the way of fantasists and sociopaths. Well, I certainly appreciate your honesty. I’m an NRA member & while they often can sound tone deaf I think they take that hard line because they know that many gun control advocates feel the way you do, but are far less candid in expressing it. In a democracy rights are generally taken away incrementally. It’s a tug of war. If one side of the rope goes slack for a moment the other side gains ground. I think with gun control there’s that kind of energy on both sides of the issue which is too bad. You’d think you could relax a little when something’s a constitutional right but I guess life’s not like that. I did not see the urban vs rural divide mentioned here, but it is worth bringing up. Urban areas are typically leftist, and urban areas consider themselves to be the center of power – the thesis, I suppose – and the rural areas tend to feel disenfranchised by the urban areas. The urbans feel they control the monopoly on violence, so they do not see any need to have public access to arms. Interestingly, when the rural areas were the center of power in the medieval era, the situation was somewhat reversed, with the budding cities forming militias and attempting to assert themselves politically (yes, a gross generalization, but it makes a point about access to power). I did make the same argument to mainstream liberals more than two decades ago, and it was like pouring water on a robot. They simply could not conceive that a monopoly on violence was not a good thing, and they themselves might be objects of persecution at some point. The Second Amendment is a very Leftist amendment, precisely because it has nothing to do with the personal possession of handguns. The 2nd guarantees a right to “bear arms” which any good dictionary will tell you a metonym for military service. (This explains the otherwise inexplicable militia preamble.) According to the 2nd amendment, the government cannot forbid (originally white male) citizens from being drafted into their local militia. Since this was before the invention of the police force, a reasonable extrapolation from 2nd amendment and the post-Civil War amendments is that black people have the same right to participate in the police as whites and cannot be excluded on the basis of race or ideology. That’s a very leftist claim! It would obviate the need for a Black Panther police monitoring group, for example. As far as revolutions go, revolutions inevitably are resolved by army involvement. Either the army crushes the revolutionaries or the army defects and joins their side. There is no third precedent in which a non-military force of individuals resolves a revolution. The 2nd amendment wisely anticipated this. Because every individual has the right to serve in the military on condition of fitness, if the Easterners decide the crush the Westerners, the army will be composed of both Easterners and Westerners and will not be crush the West without internal dissent. That’s the mechanism the Founders envisioned because that was the reality they had just lived through! The first battles in the Revolutionary War were all about militias trying to seize armories before the British could do it because both sides knew that only military arms would be effective in the coming war, no hunting rifles. In a potential future American civil war, the only way the non-tryannical side can win is if they have a significant fraction of the military on their side. Without that, revolution is impossible. The Left wants to remove all firearms from citizen hands because armed citizens pose an ultimate challenge to the total state power and control that every Leftist cherishes in his/her heart. Or to put it another way, the Second Amendment puts teeth in all the other amendments. Mandatory licensing and training for basic military service should satisfy the “well regulated militia” part, with sensible limits imposed on the number and the type of weapons you get to keep at home. “Self-regulated” backyard militia does not qualify. Bazookas and TNT or an arsenal of handguns and rifles in your house don’t qualify. I have quite a few thoughts about this issue: first of all, it is a myth that the Bolsheviks overthrew the Czar/Tsar. The Czar was overthrown in the summer of 1917 (June, I believe) by a motley collection of democrats (meaning pro-democracy), socialists and, anarchists. This kicked off the Russian Civil War, a multi-sided power grab (in which even the US participated) that the Bolsheviks ultimately won because they were better organized and equipped (due to controlling the factories) than everybody else, NOT because they had popular support. Also, in both the American Revolution and Vietnam the winners didn’t win militarily; the losers realized that the continued prosecution of the war was working against the reason for fighting the war in the first place. In the case of the American Revolution, the British realized that they were spending far more on maintaining an army in the Colonies than they could ever hope to collect in taxes from the Colonies. If you look at the battles fought, it was about 50-50. In the case of Vietnam, I would just like to point out two things: one, the Viet-Cong had the stuffing pounded out of it and two, the war (which was fought to stop the spread of Communism) made Communism more popular globally. In general, the cases in history where the armed insurrection succeeded were ones where the powers fighting the insurrection were already greatly weakened. (In the case of Russia in 1917,the Russian government had basically been on life-support for decades.) Also, there are a ton of cases where popular resistances were eventually crushed (the British in the Malay peninsula, the Boer War, the Polish resistance in WWII, all Medieval peasant revolts, etc.) Overall, the idea that a spontaneous, armed, mass uprising can defeat a strong, motivated, well organized government is pretty Pie-In-The-Sky. Of course, the idea that an unarmed mass uprising could do that is even more Pie-In-The-Sky. In the few cases where they “worked”, there was either a threat of an armed uprising under favorable circumstances (as with India) or there were people in power who found supporting the movement politically expedient (as with the Civil Rights movement). I’m sorry Libertarians/Anarchists, popular mass uprisings generally don’t work and when they do they tend to get commandeered by Communists/Fascists/Generic-Megalomaniacs. Secondly, when it comes to the American gun debate, that point I just made is moot, as are virtually all arguments about the pros and cons of various gun policies. America has lax gun laws because Americans want guns, and Americans want guns because it is a part of American culture. The gun debate is a culture war, and the Right has won it. Just look at how opinions on guns have changed over the last few decades: support for gun control has dropped over the last twenty years even though the country has become more Liberal. Ultimately, the Left fought Guns the same way the Right fought Gay Rights, politically, and had the same result. Policy proposals were never going to beat first-persons shooters. And in case you think that this is unique to America, the gun culture is spreading to the rest of the world. Russia has a pretty strong gun rights movement. Even in New Zealand, where I live, young people have a much greater tolerance of guns than older people. So there you have it. One poster wrote: “Because the overwhelming evidence from the rest of the developed world proves that A) it works in reducing gun violence”….. Except it doesn’t. Britain, Canada and the UK all had lower gun violence rates than the US long before their current gun laws were enacted. They had low murder rates, brought in laws to make collecting more difficult, and had roughly the same murder rates afterwards. Administrative gun laws are for show. They’re security theatre as anyone in Latin America, the Middle East or Chicago must know. Why? People who feel they need firearms for protection (or aggression) don’t disarm. It would be illogical to give up a gun you keep for self defense out of fear of jail. Emil Bogan. You don’t still believe that rules about how the government can set up part of the military were put in the Bill of Rights do you? Or are you just looking for a sneaky way around the law? Actually by 1972, Pres Nixon made the case and we won the conflict. The North did not invade until 1975, when Pres Nixon was not in office and the Congress opted to cover their six with the War Power Act. If someone waits to reenter the ring after the bout is called, It’s a safe bet you won. The country needs a root canal to remove : the we lost vietnam” mantra from its soul. I have often asked, why do self-styled leftists want to let Republicans have all the guns? There is an excellent book published in 1979, with a forward by Idaho Sen. Frank Church, offering liberal arguments against gun control. (Church explicitly said, paraphrasing a little, hey, I’m from Idaho, of course I support the right to keep and bear arms). Among other featured bits of history, was the description that, if one is being chased by the KKK, you pull over and run for the woods. If you are armed, you duck into the trees, turn around, and open fire. The KKK disappears, being out for a little fun, not to actually risk their own life and limb. If you are not armed, you hope you can outrun them. Also, when civil rights marches settled down for the night in tents on the grounds of churches brave enough to host them, word was put out in the local community that there would be a few men armed with repeating rifles on hand. The KKK didn’t show up, again, not being interested in actually putting their lives on the line for anything. I’ve heard many black clergy argue passionately for getting guns off the street. I think there is good cause for that. Every time two knuckleheads start arguing about who is stealing whose baby mama’s clothes, they aren’t skilled enough to hit each other, but always manage to put a bullet in a ten year old girl playing nearby. The emphasis is on, off the street. Also, people playing with guns who don’t know much about them. As for the insurrection argument… it really depends on the breath and depth of popular upsurge. A small band of defiant people can easily be smothered, usually without killing many of them, if any. And, in general, a government should uphold the law and maintain order. That’s what allows we the people to have peace and quiet enjoyment. But if a really large portion of the population is up in arms, that’s when the government has to calculate what it will have left to govern if it responds with massive retaliation. The point about the tax base being in the US is a good one. And, the more widespread the uprising, the more likely it is that the military will go over to the revolution. I don’t actually expect a spectacular “to the barricades” style revolt again. Life is too complex. Millions would die without functional plumbing, food deliveries to supermarkets, functional natural gas deliveries to heating systems, etc. But, its not a bad idea to give the government pause. Push us too far, things can spiral out of control. For the Left, guns are essential. Guns equal crime, disorder, poverty and government dependency. They yield a guaranteed twelve percent of the vote every election. Why else would there still be guns in America? The Left never yield to any resistance. Look at abortion and gay rights, and the war on marriage, the family and gender roles. If the Left wanted to get rid of guns, they would be gone. Republicans support handgun profligacy because they get paid to do it. If you want to restrict the power of the State, follow the Seconnd Amendment as it is written and as its origins dictate (from the English Constitution). IT’S ABOUT MILITIAS. If you want a free country, you can’t have a standing army under the central government’s control. You cant’ have heavily armed agents of the State roaming the streets. You must put land forces under the control of local MILITIAS as in the British Empire since the Glorious Revolution. I have to disagree with this point. Some small share of progressives want to kill people they disagree with, specifically duly elected government officials, presicely because of their political beliefs (see James Hodgkinson). And some small share of progressives want to beat people to a pulp and send them to the hospital, specifically because of their suspected political beliefs (see Antifa). And when in power, progressives absolutely restrict, or try to restrict, everyone’s 2nd Amendment rights, but more importantly, everyone’s 4th and 5th Amendment rights, all in the name of domestic security. I use liberal and progressive interchangeably, because we only have two major political parties, so I believe people when they say they’re liberal/progressive and do these things. Any accusation without supporting evidence is a confession. As a Commie, Pinko Red – Trotskyist Division – AND a long-time subscriber to TAC, I’ve said here many times, “Arm the Working Class!” I absolutely agree that subverting the army will likely be necessary for the success of a proletarian revolution in the United States, but that is the long-term goal, the BIG enchilada, so to speak. Before the revolution, the left will need guns for self-defense, as will those communities and movements in which we are active. As an example, the armed Deacons for Defense – many of them veterans but some just women and men of the community armed with their own hunting rifles, shotguns and pistols – watched over and protected the non-violent civil rights activists in the South. Or Robert Williams (search for “Negroes with Guns”) whose NACCP chapter armed itself, and I think even joined the NRA to do so, to defend their community from the Klan. Armed fascists and Klansmen have attacked anti-fascists in recent months, and I don’t ever want to be in the position that the Communist Workers Party got itself in in Greensboro in 1979. Gun control is, of course, an issue where liberals prove that they are not of the left, historically speaking. Many progressives and social democrats, wooed uncritically by MLK, Gandhi and their reformist Western European co-thinkers, also fail this acid test (ooh, that might be the first time I’ve ever used that term) of revolutionary leftism. Anarchists are generally better on gun control, but they often bring so many foolish ideas and enthusiasms to the discussion. And before any starts, don’t even get me started on swine like Stalin, Mao, Pol Pot and that whole Stalinist swamp that is hopefully dead and buried. Americans afraid of tyranny still in vast numbers are too lazy, disinterested or oppressed to get out and vote. Are you advocating Swiss-style comprehensive militia training? Maybe you have nothing but good and benign intentions in advocating what you believe are ‘commonsense’ gun laws, but not everyone who claims to support such laws has such benign intentions. Plenty of people who advocate ‘commonsense gun laws’ actually advocate much more draconian measure than you do. Diane Feinstein famously told CBS Sixty Minutes that she would require “Mr. and Mrs. America” to turn in all of their handguns *if only she had enough votes to do so*. Should we not take her at her word? Well intentioned advocates of ‘commonsense’ gun laws like yourself would do more for your cause if you explicitly disavowed such draconian proposals along with their advocates. Absolutely. That was the ultimate goal of gun control supporters 30-40 years ago. I doubt it’s changed much. Rights can be chipped away at incrementally before the the real goal is realized. At least Sen. Feinstein is showing her hand here & being transparent. I’m sorry I’m unfamiliar with that line of reasoning. Is that a quote from Mao’s little red book? A couple of commenters have mentioned the urban/rural divide, mainly WRT urban elitism, but I haven’t seen any mention of the main motivation of ordinary urban voters: that crowded places are where guns are the most problematic. I think most baby boomers who grew up in cities have heard some version of a story that started with an argument in an apartment on a Saturday night and ends with a bullet going through a wall and killing someone sleeping in the next unit. In the 1920s, machine guns could be purchased by mail order. Criminal gangs used them in turf battles on the streets, resulting in a horrible death toll of innocent bystanders. In the country, a quarrel can turn violent without much danger to the uninvolved. In the city, we want the violent restricted to fists and knives and the occasional broken bottle. The most active gun control advocates are often people who have lost loved ones to stray bullets. You can have as many guns as you like “current law” but each and every round of ammunition must be purchase through a highly regulated process that requires a photo ID, proof of citizenship and a valid check that no more than “10” rounds have been purchased in the last 2 weeks. Spent cases must be turned in before any new purchase. Ammunition for multiple guns can NOT be purchases. You get 10 rounds when you return the brass. VIOLATION of this law requires any and all guns, property and assets that the guns have been on or in be turned over to new new agency that cares for gun related victims,deaths or injuries., AND a PERMANENT band of every owning another gun. 2nd offense is LIFE at hard labor with NO chance of parole. Target shooters are NOT exempt and MUST acquire ammunition with a TARGET license that has an extensive background and mental stability check by a licensed gun counselor. Each violation must be reviewed by a federal ammunition committee to insure that the conditions that allowed the offense be covered in the future. In any city, county, or state every person has the same access to firearms. Why then is the U.S. offender murder rate per 100,000 for males 6.0, but only 0.7 for females? Why is the murder rate for blacks 13.1, but only 1.9 for whites? Murder rates increase with population size from 3.0 for cities below 10,000 to 11.3 for cities over 250,000. The correlation between city size and murder rates is near 0.95, but so what? Those FBI statistics should convince any scientist that a cause and effect hypothesis between firearm availability and murder rates is untenable. The Right’s problem is it cannot distinguish the Left (Marxists) from the center right (Democrats). Remember Ronald Reagan and other Republicans of the time were probably gun control. As the country has drifted rightward Democrats have filled that position while Republicans are skirting outright fascism. Meanwhile us actual leftist; Marxists continue to support the right for the proletariat to keep and bare arms.